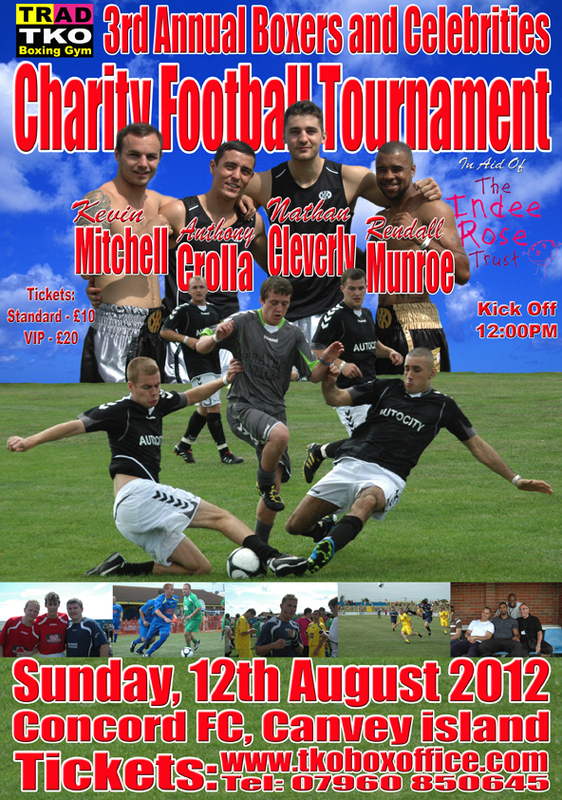 At last year’s TRAD TKO Boxing Gym’s Boxers & Celebrities Charity Football Tournament, in aid of the Indee Rose Trust, so many big names turned out to entertain the fans, amongst them a couple of chart toppers, a brace of Soap Opera stars but there can be no surprise that the biggest contingent was from the World of Boxing. Boy oh boy, there were more stars than you could shake a stick at, including WBO Lightweight World Champion Ricky Burns and his upcoming title challenger WBO Inter-Continental Lightweight Champion Kevin Mitchell, British, Commonwealth, European and WBA International Super Bantamweight Champion Rendall Munroe, British Lightweight Champion Anthony Crolla, Commonwealth Middleweight Champion Billy Joe Saunders and British Super Middleweight Champion Paul Smith to name but a very few. The boxers were in relaxed mood, well sort of as it seemed that they were as determined to win a game of football as they are when they box. Without doubt each and every one of them was a true star in their own right, however one star shone just that little bit brighter - WBO Light Heavyweight World Champion Nathan Cleverly. Just as Ricky Hatton the year before, Nathan was the perfect ambassador for the sport, he played in every game he could and his undoubted skill clearly contributed to the TRAD TKO All Stars Team making it all the way to the final, only to lose the penalty shoot out against TRAD TKO Clapton Rangers, and when he wasn’t on the pitch Nathan was busy signing autographs and posing for pictures with the fans. Nathan, along with all those named above, plus many more, will be back again this year, but as he explains it will be with his own team, which includes another legendary World Champ. We’re all looking forward to the day, I really enjoyed playing last year, as did all the fighters involved. It was a great day, really enjoyed the game of football and it was a great cause. When I heard how much money we raised I knew it had been a real success. I’m bringing my own team this year, the Welsh Warriors, I’m bringing everyone down this year, all my friends will be in the team, including Joe Calzaghe. Last year I linked back up with Tony Oakey, he was my first real introduction to Championship boxing, he was my first twelve round fight. He was a real warrior so it was great to catch up. This year Joe’ll be there, he’s a real legend of the sport, he was a big inspiration for me and of course he’s a good friend of mine as well. With Joe and the other lads in the team I think we’ll be in with a good chance to win the tournament this year. Last year I was in the TRAD TKO All Stars team that made the final, but we lost on penalties. This year I think we could go all the way as we should be the bookies favourite. We’re all looking forward to coming down to London and have another great day playing football, meeting the fans and raising much needed money for the Indee Rose Trust.